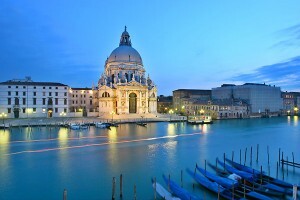 Venice and its beautiful churches: life is a fantastic and watery adventure in this town. One of the greatest place to visit ever, Venice is a multisensorial trip to bring you in an aesthetics feeling that touches all your senses! You can’t come here without visiting the enormous and artistic squares, tasting a bit of fegatini alla veneziana, with a ombra di vino (a little glass of wine) sitting outside the Florian, one of the ancient cafè in Venice!!! Your perceptions will expand in this magic, esoteric town!! The level of pulchratudine (beauty), to use a Latin word, here in Venice reaches the highest peak!! The beautiful church of Santa Maria della Salute is one of the great church to visit once in venice. Its origin are connected to a horrible event: the plague of Venice in 1630-31. To stop the hopelessness, the Venetians asked for a divine intervention, promising to build a church in honour of the Virgin Mary. The young architect Baldassare Longhena was appointed with the church once the plague was over and Santa Maria della Salute has been finished in 1682. The grateful Venetians celebrate since then the occasion on November 21st of each year. One of the town’s most incredible celebrations, with thousands of e pilgrims across a specially set up pontoon bridge. Everyone holds a candle in their hands and you can also buy it at booths placed in the square outside the church. These are completely lit inside, and the candles are put also in large trays filled with sand set around inside the church. The arrival of the Patriarch (bishop) of Venice leading a procession of priests, cardinals and carabinieri to the church is something amazing to watch and follow. This entry was posted on Thursday, November 10th, 2011 at 5:09 pm	and is filed under Events in Italy. You can follow any responses to this entry through the RSS 2.0 feed. You can leave a response, or trackback from your own site.